Call it amusing, call it ridiculous, but whatever you call it, reader James has applied the classic Martini livery to his Lada Niva weekend toy, and we call it awesome. 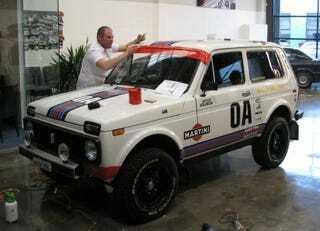 The little Ruskie brute wears the vinyl graphics with all the class and sophistication of the rally and race cars of yore. Check out the complete application process in the gallery below, and sit back imagining a weekend bombing around the rugged countryside in this pocket-sized beast.